There is plenty of cooking terms that you may not know which are regularly used in cookery shows on television or in recipe books. Some chefs like to bamboozle the public with fancy cooking terms, perhaps so they seem more impressive, but you can easily learn these skills for yourself. Recent celebrity chef programmes have highlighted the fact that many people in the UK do not know how to cook even the most basic of dishes. This means that you cannot assume that people know what some cooking terms mean and it is helpful to clarify the meanings of cooking terms that more experienced home cooks take for granted. Let’s have a look at some of the cooking terms that can be quite baffling. As they say, it’s easy when you know how! A roux is a paste made of equal parts of butter and flour, used for thickening soups and sauces. You will often see a roux mentioned such as ‘make a roux’ or ‘add in roux a teaspoon at a time’ for the start of a white sauce or to thicken a sauce, such as a pork in cider casserole. Using a teaspoon of roux whisked into a sauce does not give you any lumps and, as long as you allow it to cook for a minute or two after adding, you will not get that ‘raw flour’ taste. The cooking term ‘egg wash’ is usually connected to baking with pastry, such as pies and pasties. An egg wash is simply a beaten egg in a cup that is lightly brushed over the raw pastry before cooking to add an attractive golden sheen to the cooked dish. Traditional cooking states that only savoury pies should have an egg wash, with sweet pies having a dusting of sugar before cooking instead, but many recipes suggest an egg wash for any type of pastry cooking. 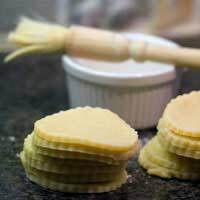 Crimping is a kitchen technique also connected with pastry cooking. It is especially connected to Cornish pasties, but is also popular with pies, plans and quiches. Crimping was out of fashion for a while, as fusion cooking and fancy recipes overtook traditional kitchen skills for a while, but now good home cooking and British classics are regaining popularity, crimping is being seen in recipes yet again. Basically, crimping is a technique used to make the edge of a flan or pie look pretty, or to seal the edges of a pasty. It is done by nipping the two edges of the pastry with the forefinger and thumb of both hands and then twisting them to make a seal. This is then continued for the length of the pasty or the whole edge of the pie. To butterfly is a kitchen cooking technique that relates to both meat and fish and helps to cook the food more quickly. It is basically a cutting technique that opens out the meat or fish, allowing more of the food to touch the cooking surface. ‘Butterflying’ is most often used for lamb, king prawns and chicken. You cut the meat or fish down the middle, usually, and open it out. You can then marinade the food in herbs, oils and spices, which can also help the meat tenderise and cook more quickly. This technique is popular for barbequing, but is also good for roasting on a high heat.